The most delicious way to burn fat, prevent cancer and be energized! WHY YOU SHOULD BE JUICING? Hello there loves! This is a bit different from my other posts but you will be seeing more variety on my post because I want to have more content about beauty and health mixed with fashion and lifestyle. This hole idea came to me while I was doing my everyday juice in the morning and thought: why not making a post about this? And that only made my mind spin and thought of a bunch new post ideas to share with you guys. You might have seen this type of post somewhere already because juicing is a bit of a trend right now, but more than a trend is something REALLY good for your body. 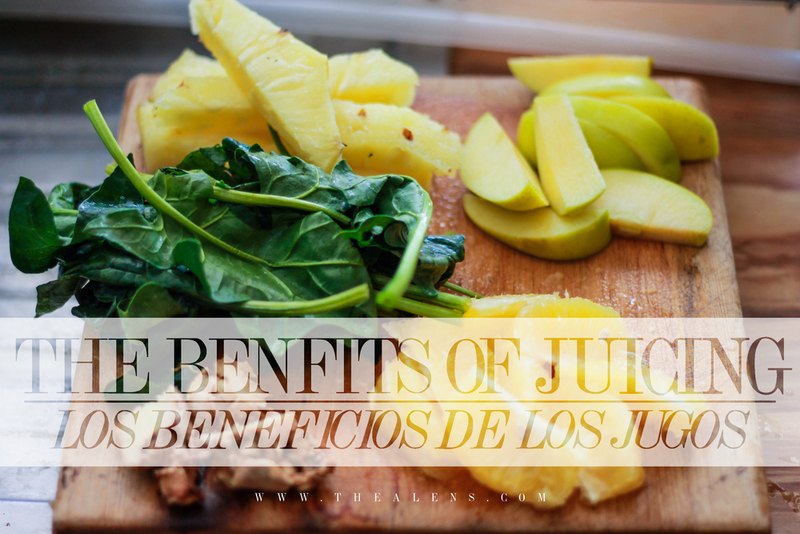 I a junk food lover I have to admit, but that doesn't mean I don't like to take care of my body so I made some research and found a great way to nurture my body without eating veggies ALL DAY and that was: juices. Having a good juice in the morning with the right proportions of fruits and a generous quantity of veggies can really make a difference for our body. In this post I decided to tell you about my favorite juice which is green juice. Many people have disgust and fear only by hearing the name but it's all about myths, what is not a myth is that it is super healthy option and yes, IT TASTES AMAZING. In my juice I like to have from 1 to 3 fruits to add a better flavor, no more than that because if you add too many fruits you will also have too many sugar on your juice and that is not the idea. Next I add some veggies and some ginger, this last one is known because of its many benefits like being a natural anty-inflammatory. Juicing helps you absorb all the nutrients from the vegetables. Juicing allows you to consume a healthier amount of vegetables in ONE SINGLE GLASS. You can add more variety of vegetables in your diet. Promotes and helps for weight loss. Hola amores! Yo se que este post es un poco diferente pero estarán viendo más variedad en mis post porque quiero agregar más contenido como este que trate de belleza y salud mezclado con moda y estilo de vida. Toda esta idea se me ocurrió mientras hacia mi jugo en la mañana y pensé: porque no hago un post sobre esto? Y de ahí mi mente empezó a hacer mil ideas de posts que quiero comprartirles. Tal vez hayan visto este tipo de post en algún otro lugar ya que hacer jugos es una tendencia ahorita, pero más que una tendencia es algo MUY bueno para tu cuerpo. Yo soy una amante de la comida chatarra tengo que admitirlo, pero eso no quiere decir que no me guste cuidar mi cuerpo así que hice un poco de investigación para nutrir mi cuerpo sin tener que comer vegetales TODO EL DÍA y el resultado fue: jugos. Tomar un buen jugo por la mañana con las porciones correctas de fruta y las generosas cantidades de verduras puede hacer la diferencia para tu cuerpo. En este post decidí hablarles sobre mi jugo favorito el cual es el jugo verde. A mucha gente le disgusta y le da miedo el simple hecho de escucharlo pero son sólo mitos, lo que no es un mito es lo saludable que es y que, SABE DELICIOSO. En mi jugo me gusta agregar de 1 a 3 frutas pero no más ya que si añadimos demasiadas frutas estas añadiendo demasiada azúcar a tu jugo y esa no es la idea. Luego agrego los vegetales y un poco de jengibre, este ultimo es conocido por sus múltiples beneficios entre ellos ser un anti-inflamatorio natural. Los jugos te ayudan a absorber todos los nutrientes de las verduras. Los jugos te permiten consumir una cantidad saludable de verduras en UN SOLO VASO. Puedes agregar más variedad de verduras a tu dieta. Promueve y ayuda a la pérdida de peso. Ayuda a tu salud cerebral. This is my normal amount of fruits and veggies, (oranges are optional, I add them only in winter because of Vitamin C) / Esta es mi cantidad regular de frutas y vegetales (la naranja es opcional ya que yo solo la agrego en invierno por la Vitamina C. This is too much ginger to use (unless you like the spicy taste), I only use a bit of these like the size of a thumb. / Esta cantidad de jengibre es demasiada a menos que te guste un toque picoso, yo solo uso un poco del tamaño de un pulgar. For the orange is totally optional, I suggest only using 2 fruits but in winter I like to keep my Vitamin C levels so I add one orange to my juice. / La naranja como ya lo había mencionado es opcional, yo sugiero usar únicamente 2 frutas normalmente.In the case of veggies you can use as much as you like, I use about a cup of spinach and recently I added a half of cucumber and some celery. / En el caso de los vegetales usa tantos como te guste, yo uso una taza de espinacas y recientemente añadí medio pepino y apio. The apple of my suggestion would be green golden one, this is a good fruit to add because of it's great taste with almost any veggie. / La manzana de mi sugerencia es usar la verde golden, es una fruta que combina excelente con la mayoría de los vegetales. 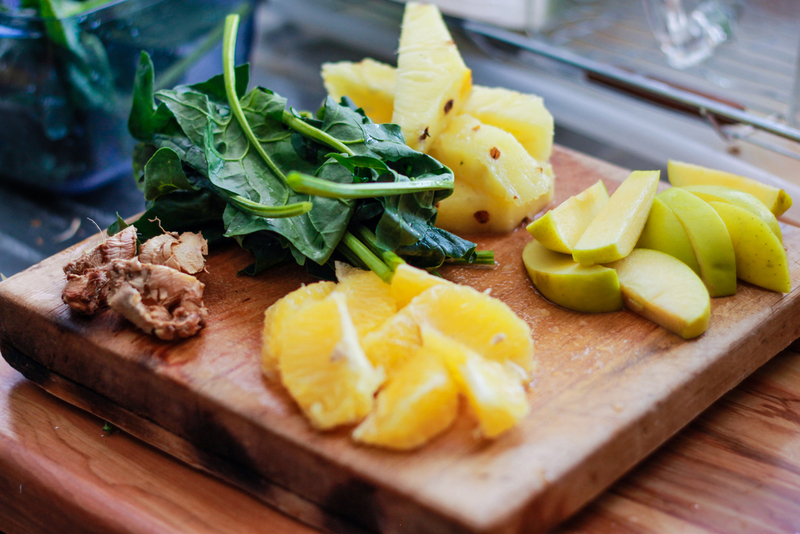 The pineapple is one of my escentials for green juice, it add a great sweet and sour twist. I use just one slice. / La piña es uno de mis escenciales, me gusta que añade un sabor agrio y dulce a la vez, yo sólo uso una rebanada. Put the veggies on your juicer followed by a juicy fruit like apples, it will help get more juice from the veggies and its easier for the juicer. / Pon los vegetales seguidos de una fruta jugosa como la manzana, esto ayudara a que los vegetales suelten más jugo y ayuda al extractor.And VOILÀ! A super good tasting juice to kick off your day (and you didn't have to eat a whole plate of veggies to get the nutrients). / Y VOILÀ! Un jugo que sabe delicioso para empezar tu día (y no tuviste que comer un plato de vegetales para obtener los nutrientes). SEE YA ON MY SOCIAL MEDIA! / NOS VEMOS EN MIS REDES SOCIALES! This year was one the best years of my life so far, it was a year full of love, happiness, travel, adventures, new people, and certainly was born one of my biggest dreams : THE A LENS. This wonderful year began with sadness and happiness at the same time as I was leaving to the beautiful city of Florence in Italy for a semester of Fashion Marketing there, I had mixed emotions, happiness because I wanted to explore and do so many new things and learn all about the fashion industry but I was also sad to leave my loved ones for so long. Got to Florence and since I saw from the plane I knew I wanted to explore every corner of the city, it is one of my favorite places now, it's too beautiful to describe with words and there I met great friends with whom I spend the rest of the semester and did wonderful trips. One was near Florence, we went to Milan for fashion week and neither snow nor cold stopped me to be in the shows and concourses where the personalities would gather before entering and there I met two of my favorite fashion bloggers : Chiara Ferragni and Kristina Bazan . But that was not the best, but it was amazing, I saw the great Anna Wintour, I had the biggest mini heart attack of my life, and next to her I saw Anna Dello Russo which was an experience that I still do not believe it. At The Arch of Peace many shows happen and there I saw for the second time several personalities and also got interviewed me for a magazine Korea! Amazing right? But that was not all, I went in Italy to the largest cities to the smallest villages in the beautiful Tuscany. After that I took a trip a little further, I went to Istanbul ! I had always listen how beautiful and amazing it was Turkey and the wonders we had to know in Istanbul and it is true, it's an awesome place, it's beautiful, the culture is so rich and the people are very warm. I went to the Blue mosque and Hagia Sophia, the Grand Bazaar and many other places of this beautiful city. After that I went to Belgium, there I went to Bruges and Brussels, where the only thing I remember is eating, eating and eating. They are very picturesque cities, as if you where in a movie but the best of them is their food, they have the best fries, waffles, chocolates and many types of beer! It is a place you should definitely visit . After eating so much I went back to Florence where we had tickets to go to the concert of my dreams: Lana del Rey. I went the weekend to Torino to see her, it was the best concert of all and more than I imagined. After that I went back to Florence to celebrate my birthday on May 14 and it was a day full of surprises, the best gift was that my boyfriend being in Mexico sent me a bouquet of roses, a card and a gift I wanted for some time. Then the semester finished and I got my sister and my best friend to visit and to do a tour in Europe where we visited many cities such as: Florence of course , Rome and its charms , the magic Venice, the romantic and endless Paris , Barcelona and it's perfect weather and from there we continue to the end with Ibiza. Definitely my year was wonderful, but the best of it was to make one of my biggest dreams come true : THE A LENS. I always wanted to have a fashion blog and with the help of my boyfriend (I LOVE YOU BABE) and the support of all who read it today is a dream come true. One of the biggest moment of THE A LENS on 2013 was the spread on ELLE MEXICO on the Novembre issue and that was another dream that came true!! Thank you very much to all who read it and are fans, I love to create outfits post for my readers , but what I love more is to be able to express my love for fashion and photography. Thank you very much for being part of my 2013! See you in 2014! Este año fue uno los mejores años de mi vida hasta ahora, fue un año lleno de amor, felicidad, viajes, aventuras, nuevas personas, y sin duda vio nacer uno de mis mas grandes sueños: THE A LENS. Este maravilloso año comenzó con tristeza y felicidad al mismo tiempo ya que yo partía hacia la bella ciudad de Florencia en Italia para hacer un semestre de Fashion Marketing allí, tuve emociones encontradas porque moría de la felicidad por conocer tantas cosas nuevas y aprender todo sobre la industria de la moda pero estaba triste por dejar a mis seres queridos por tanto tiempo. Llegue a Florencia y desde que lo vi por el avión quise recorrer cada rincón de esa ciudad, es uno de mis lugares favoritos ahora, es demasiado bonito para contarlo con palabras y ahí conocí a grandes amigas con las que pase el resto del semestre e hice maravillosos viajes. Uno de ellos fue cerca de Florencia, fuimos a Milan a la semana de la moda y ni la nieve ni el frío me detuvieron para estar en los shows y en las explanadas donde se reunían las personalidades antes de entrar y ahí conocí a dos de mis fashion bloggers favoritas: Chiara Ferragni y Kristina Bazan. Pero eso no fue lo mejor, aunque fue increíble, vi a la grande Ana Wintour, me dio el mini infarto mas grande de mi vida, y seguida de ella a Anna Dello Russo lo cual fue una experiencia que aun no me la creo. En el Arco de la paz suceden muchos shows ahí vi por segunda vez a varias personalidades y también me entrevistaron para una revista de Korea! Que increíble no? Pero eso no fue todo, de ahi recorrimos todo Italia conociendo desde las mas grandes ciudades hasta los pueblos mas pequeños de la bella Toscana. Despues hice un viaje un poco mas lejos, fui a Estambul! Siempre escuche lo bonito e increible que era Turquia y de las maravillas que habia por conocer en Estambul y es cierto, es un lugar impresionante, es hermoso, su cultura es tan rica y su gente es muy calida. Fui a la mesquita azul y a Hagia Sophia, al gran bazar y a muchos otros lugares de esa hermosa ciudad. Despues fui a Belgica, fui a Brujas y a Bruselas donde lo unico que recuerdo es comer, comer y comer. Son cuidades muy pintorescas, como de pelicula pero lo mejor de ellas es su comida, tienen las mejores papas fritas, waffles, chocolates y miles de tipos de cerveza! Es un lugar que sin duda deben visitar. Despues de tanto comer regrese a Florencia donde tenia los boletos para ir al concierto de mis sueños: Lana del Rey. Fui el fin de semana a Torino a verla, fue el mejor concierto de todos y mas de lo que imaginaba. Despues celebre mi cumpleaños en Florencia el 14 de Mayo y fue un dia lleno de sorpresas, la mejor fue el regalo de mi novio que el estando en México me mando un ramo de rosas, una carta y un regalo que queria desde hace tiempo. Luego termino el semestre y llego mi hermana y mi mejor amigo a visitarme y hacer un tour por Europa donde visitamos muchas ciudades como: Florencia por supuesto, Roma y sus encantos, la magica Venecia, la romantica e interminable Paris, Barcelona y su clima perfecto y de ahi nos seguimos a finalizar con Ibiza. Sin duda mi año fue maravilloso, pero lo mejor de el fue hacer realidad uno de mis mayores sueños: THE A LENS. Siempre quise tener un fashion blog y con la ayuda de mi novio (te amo amor) y el apoyo de todos los que lo leen hoy es un sueño hecho realidad. Un gran momento para THE A LENS fue aparecer en ELLE MEXICO en la edición de noviembre, ese fue otro sueño hecho realidad. Les agradezco mucho a todos los que lo leen y son seguidores, amo crear post y outfits para mis lectores pero lo que mas amo y poderles expresar mi amor por la moda y la fotografía. Muchas gracias por ser parte de mi 2013! Nos vemos en el 2014! COLLABORATIONS: WHITE VELVET MX, STYLECASES, KROZE BOUTIQUE, GJG DENIM, LOOKLIVELUXE CO, ELLE MEXICO. Thank you all!